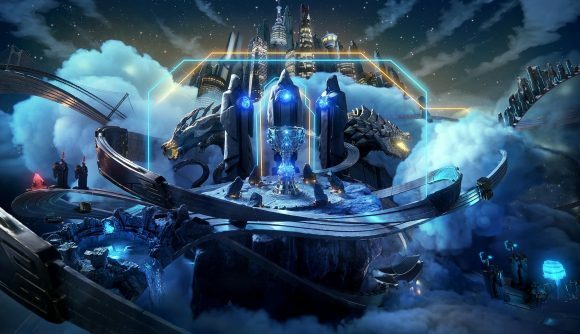 The Play-In Stage of the League of Legends World Championships has concluded, with Cloud 9, EDG, G2 Esports, and G-Rex advancing to the next stage. The Play-In Knockout stage saw the remaining qualifiers battle it out in Seoul, for a place in the Group stage. The Group Stage will be held in Busan from October 10th – 17th and will see the 16 qualifying teams whittled down to eight. The draw for the Group Stage has also been revealed, and it’s not looking too hopeful for North American fans. 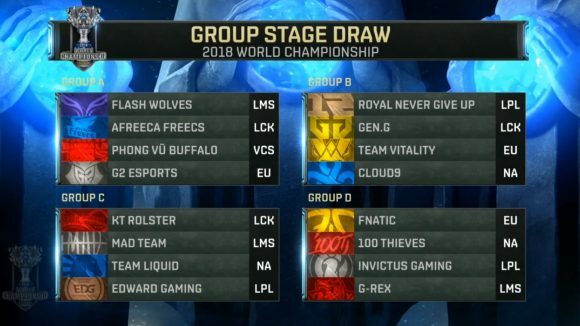 EDG has been sorted into Group C, along with Team Liquid, KT Rolster and Mad Team. Things are even less hopeful for Cloud 9, who have landed in the ‘Group of Death’, with former champions Royal Never Give Up. Also in this group are Gen G and Team Vitality. G2 were dealt a relatively easier hand, landing in Group A with Flash Wolves, Afreeca Fleecs and Vong Fu Buffalo. Rounding out the roster is Group D, which consists of Fnatic, 100 Thieves, Invictus Gaming and G-Rex. Despite being arguably North America’s best team, Cloud 9 underperformed in the Knockout Stage, while EDG came across stronger than ever. The top four teams in the Group Knockout Stage will advance to the Grand Finals, which will be held Incheon, South Korea.